Many of our favorite brands provided products to make our event a success. 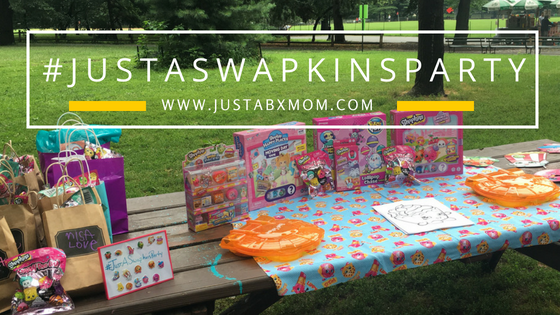 You might remember that we attended a Shopkins Swapkins party last year hosted by one of our blogger friends, FabGabBlog. We had so much fun I knew we needed to do one of our own this year. I wanted to make sure the littles invited had at least as much fun as we had at our first party. Getting the guest list together was difficult. JustaBXgirl has so many friends and we didn’t want to leave anyone out. We decided that this party would be exclusively for her blogging friends and worked on the list together. I learned from her birthday party that it is very important to include our littles in the guestlist portion of events for them. As adults, we know the capacity and other logistics that come to events BUT we don’t know it all. The person that was your littles best friend last week might not be their best friend today. The friend’s child we just knew would be our little’s bestie might just be their worst enemy. Ask your little who they want at their events. And do your best to include those people. Again, my little has many friends so sometimes I have to remind her of capacity issues and help her narrow down her list but I love watching her get to the final number. Can I share here that I was so impressed with the final RSVP list? EVERY single person that RSVPed for #JustaSwapkinsParty showed up. I have NEVER had that happen before. Once we had the list down, JustaBXgirl decided that she wanted to check each of her guests in on the day of the party and give them a VIP bracelet. Each guest was also given a raffle ticket. I thought it was a really nice addition to the event. Her guests seemed to like the bracelets and everyone likes a raffle. If you like a raffle, keep reading to enter to win your own prize! I know that littles have short attention spans because let’s be real, adults have short attention spans. I wanted to make sure they had lots to do and space to do it. I also wanted to give littles freedom to do things at their own pace. We set up a games area with some really fun titles from Goliath games and an arts & crafts area stocked with Paint Station paint and Shopkins coloring sheets. There were also crayons and stickers for our little artists. Our guests were able to go where they were comfortable. Some jumped right into games, some took advantage of us being in a park and ran around on the grass, others headed to the swings and some had fun creating artwork. After some choice time, we brought the guests together and decorated cupcakes from JC Dominican Cakes before we got to the swapping point of the party. I can share this with you since we’re friends. Asking littles to swap is scary. You never know what will happen. Things can go south really quickly. Somehow, someway our swap was tears free. The swappers did a great job making sure everyone got the chance to swap and store their new Shopkins. After we finished swapping we held the raffle. Now, I know that normally a host wouldn’t participate in their raffle BUT I was so proud of how well JustaBXgirl did as a hostess. She greeted all of her guests. She made sure everyone was having fun. She even packed all of the gift bags herself. I let her participate in the raffle and somehow she WON the first prize and got to take home an extra three Squish-Dee-Lish! The grand prize was a Shopkins Season 10 Mini Pack. Our friends over at Two Geeks won that! And because this mama wasn’t trying to come home with a hundred bags we sent two of our guests home with Paint Sations. Everyone else took home gift bags filled with more Shopkins fun. It was such a fun day that we’re already planning our next play date (or six). If you’re an NYC blogger fill out this form to be on the guest list for a future #JustAPlayDate. Enter to win a Season 10 Shopkins Collector’s Edition Mini Pack. We just started getting old enough for the Shopkins, so Season 10 is just as cute as all of them. Season 10 is a great place to start because it is a remix of seasons 1, 2, and 3! My favorite shopkins is season 1. You must be excited about season 10 then! My favorite season is season 10! I’m new to Shopkins. And I had so much fun at your shopkins swapkins party! I hope I win! My niece is so into Shopkins. She loved season 1. My daughter loves season 2! Season 3 is our favorite so far….lol. My niece loves season 3! They are all adorable! Thanks for the super cute giveaway! Good list! Two Christmases ago 5 below had an awesome sale and I did an advent calendar filled with them for my daughter. My daughter likes Shopkins season 3. That’s when we started collecting! My daughter liked season 8. She’s a world traveler at heart! We loved season 1 and 3 best, but they are all great fun! We’re big season 3 fans too! I think that might be where my daughter originally found them too! My daughter likes Season 1. My favorite would be season 10. I most like season 1! We love Shopkins. We really don’t have a favorite but love them all. This is awesome. Thank you! My daughter loves all the seasons. She collects all of the seasons.